A variety of chalcedony, a type of quartz. Agate is a very hard stone valued for its bands of color. One kind of agate for which the Southwest is particularly well-known is petrified wood agate, much of which can be viewed at Petrified Forest National Park, due west of the Zuni Reservation. 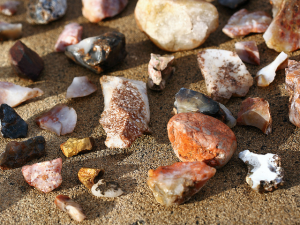 Pieces of raw agate gathered near Abiquiu, New Mexico. cobalt123, photograph dated April 11, 2012. 2014 Agate House. http://www.nps.gov/pefo/historyculture/agate-house.htm, accessed August 27, 2014.